A nkylosing spondylitis (AS) is a chronic systemic inflammatory rheumatic disorder of uncertain aetiology that primarily affects the axial skeleton (sacroiliac joints and spine). Sacroiliac joint involvement (sacroiliitis) is its hallmark.1 The course of AS is highly variable and can be characterised by spontaneous remissions and exacerbation, particularly in early disease. The disease activity, however, generally persists for many decades, rarely entering a long term remission. The disease in some patients may be relatively mild or stay limited to the sacroiliac joints and the lumbar spine. Many patients may not seek medical help, which combined with the insidious nature of AS, may preclude an early diagnosis. There is currently no cure for AS, nor is there any medical intervention which can prevent or retard its progression. Figure 1, which represents data collected by a 78 item professional survey of patients with AS conducted by the German AS society in 1996, illustrates well the protracted time delay between onset of AS and its diagnosis.5 A total of 1614 patients with AS responded to the questionnaire. 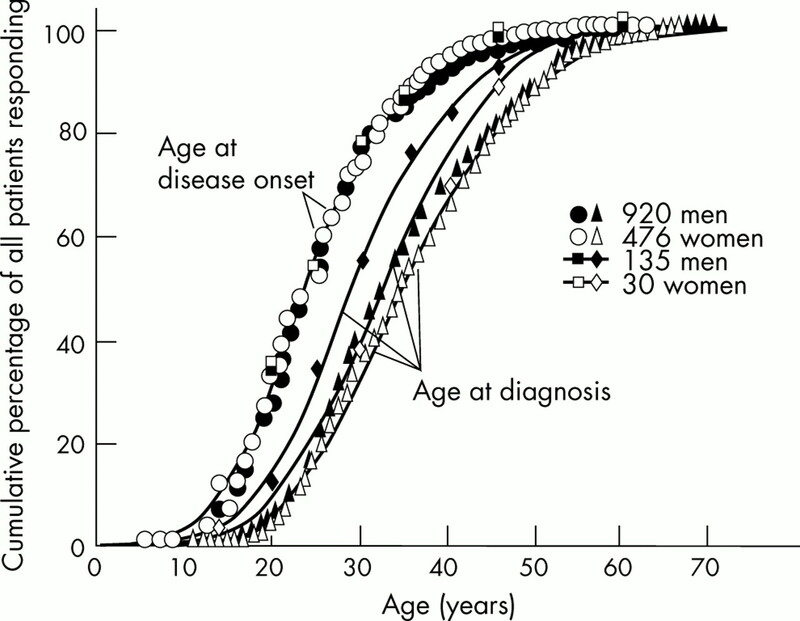 The average age at onset of the disease was 25.7 years, and the average delay in diagnosis was 8.9 years. A significantly greater delay in diagnosis was seen among women than among men (9.8 years v 8.4 years; p<0.01). This discrepancy in disease detection between the sexes reflects the common problem of underdiagnosis of AS among women, probably owing to the misconception that women rarely have AS. Cumulative distribution of the age at disease onset (occurrence of the first spondylitic symptoms) and of the age at diagnosis for 920 male and 476 female patients with ankylosing spondylitis. Reproduced with permission from the authors and Current Opinion in Rheumatology from reference 5. Copyright © 2000 by Lippincott Williams & Wilkins. Many investigators have tried to set and refine guidelines for the diagnosis of AS. The modified New York diagnostic criteria commonly used today are readily applicable to patients showing clear radiological evidence of AS, but they are of limited use in the absence of defined radiological signs.11 For example, the definite diagnosis of AS cannot be made unless the patient shows unequivocal radiological evidence of grade II sacroiliitis bilaterally, or grade III sacroiliitis unilaterally. This criterion does not acknowledge juvenile patients or those in their late teens or early twenties with disease activity that has not yet progressed to the point where their sacroiliitis is unequivocally detectable by x ray examination.7,8,12 This is also true for those patients who may have an undifferentiated form of SpA that may progress over some years to meet eventually the modified New York criteria established for AS.1–4,8,12 Thus, the diagnosis and treatment of AS and related SpA in the early stages may often be related more to patients’ clinical presentation and to clinicians’ personal experience and intuition than precise diagnostic criteria. This clinical dilemma represents the wide chasm that exists between the onset of AS and its definite diagnosis and, subsequently, its appropriate treatment. Many researchers have attempted to bridge this chasm by establishing criteria for the early diagnosis of AS4,13,14; however, none of these criteria have been universally accepted. Thus, at present, doctors cannot look to established criteria for assistance in detecting early or atypical AS. Early diagnosis of AS is highly desirable15 because (a) it enables the institution of treatment before permanent limitation of spinal mobility and spinal deformity have set in, and (b) it provides the clinician with the opportunity to monitor trends in spinal pathology that might result in abnormal posture. However, considerable progress is needed to improve the chances of a very early diagnosis of AS. Firstly, a global consensus needs to be reached on criteria for diagnosis and staging of AS—the aspects of clinical management that are fundamental to designing effective treatment strategies. Also, current diagnostic and classification systems for AS do not reflect the broad range of clinical and radiological presentations of the disease.12–14 This limits the ability of clinicians to diagnose patients with AS at an early stage and provide proper management. These needs were recently acknowledged in a questionnaire based survey conducted by the experts participating in the Ankylosing Spondylitis Workshop held in Berlin, Germany, in January 2002, and resulted in a proposal for staging of patients with AS that is presented in this supplement. (see p iii19) These offerings are an excellent starting point for establishing basic understandings among investigators and clinicians for the evaluation of treatment outcomes. At present, a wide assortment of methods for assessment of AS has been suggested,16 but no particular method has been accepted universally, and no guidelines for the use of assessment measures have been established. Disease outcome depends on the speed of spinal ankylosis.3 There are many indicators for a severe disease outcome in patients with AS, such as onset at 16 years of age or younger, severe pain, grade IV radiographic spinal structural damage, limited spinal mobility, significant functional impairment, a need for regular pharmacological intervention, the lack of efficacy of non-steroidal anti-inflammatory drugs (NSAIDs), a requirement for corticosteroid or sulfasalazine treatment, ocular involvement, hip or knee involvement, and a requirement for surgery.17 Recently, the Assessments in Ankylosing Spondylitis Working Group defined a core set of domains for the evaluation of AS in the setting of disease controlling antirheumatic treatment and symptom modifying antirheumatic drug treatment in conjunction with physical therapy, and also for clinical record keeping.18,19 Which instruments most appropriately assess these domains—for example, the Bath Ankylosing Spondylitis Functional Index (BASFI) or the Dougados Functional Index (DFI) for function, and the visual analogue scale or the Bath AS Disease Activity Index (BASDAI) for pain, have yet to be determined. Moreover, application of the selected instrument in the assessment of treatment outcome, and the definition of treatment efficacy, are other unresolved issues. TREATMENT: IS IT TIME FOR A CHANGE IN PARADIGMS? Perhaps the most disheartening inadequacy in the care of patients with AS is the lack of therapeutic options which significantly impact and slow or halt disease progression. Unarguably, the use of NSAIDs rapidly relieves inflammatory back pain in patients with AS,20–23 earning these agents the status as the “gold standard” for drug treatment in AS.20 In fact, a dramatic response to NSAID treatment generally confirms the diagnosis of AS in a patient with a high index of clinical suspicion of the disease.24 However, patients experience clinical benefit only when they are regularly taking NSAIDs, preferably in full anti-inflammatory dose. The clinical benefit of these agents does not continue once these drugs are stopped. Furthermore, in many cases, NSAID use is limited by gastrointestinal side effects, with minimal clinical benefit from NSAIDs as the disease progresses. Gastropathy results from the cytotoxic effects of NSAIDs on the gastrointestinal mucosa and occurs in most patients treated with NSAIDs.25 Most gastrointestinal symptoms are mild, but serious symptoms can sometimes occur, such as gastrointestinal bleeding and perforation.26 The risk of such serious gastrointestinal side effects is reduced by the use of newer but more expensive NSAIDs that selectively inhibit cyclo-oxygenase-2 (COX-2).27–29 However, COX-2 inhibitors (the so-called “coxibs”) are not more efficacious than conventional NSAIDs, and are not associated with a significantly lower incidence of the more common, less serious gastrointestinal side effects, such as nausea, and dyspepsia that bother most patients.27–30 Thus, as effective as NSAIDs may be, their overall clinical benefits are relatively limited. There is a clear need for effective new drug treatments for AS because no currently available drug can retard the process of fibrous and bony ankylosis and alter the natural course of the disease. None of the previously mentioned treatment options affect the underlying pathogenic mechanisms of the disease. In the past few years, tumour necrosis factor alpha (TNFα) has been identified as a key regulatory cytokine in the inflammatory cascade and has been the focus of research in the pathogenesis and treatment of rheumatic and other inflammatory disease states. Clinical trials with the two anti-TNFα agents currently in clinical use, infliximab (a monoclonal anti-TNFα antibody) and etanercept (a soluble TNFα receptor fusion protein), have established their efficacy in reducing the signs and symptoms of RA.50,51 Perhaps the most exciting finding of these studies is radiographic evidence that pharmacologically blocking the action of TNFα is an effective mechanism for halting or retarding the progression of joint damage in RA.52,53 Infliximab and etanercept have recently become available for clinical use in the treatment of RA. Infliximab, in combination with methotrexate, is approved for reducing signs and symptoms, improving physical function, and inhibiting the progression of structural damage in patients with moderately to severely active RA who have had an inadequate response to methotrexate. Infliximab is also approved for the treatment of moderately to severely active Crohn’s disease inadequately responsive to conventional treatment. Etanercept is approved for the treatment of moderately to severely active RA in patients who have inadequate responses to one or more DMARD, or in combination with methotrexate in patients who do not respond adequately to methotrexate alone. Several lines of evidence suggest a role of TNFα in the pathogenesis of AS. Firstly, the overexpression of TNFα has been documented in sacroiliac joints of patients with AS.54 Secondly, increased levels of TNFα have been detected in synovial fluid and synovial tissue from patients with psoriatic arthritis, another SpA.55,56 Thirdly, in vitro studies have demonstrated high concentrations of TNFα in gut mucosa biopsy samples taken from patients with Crohn’s disease,57,58 an inflammatory bowel disease strongly associated with AS.45 Finally, studies have shown abnormalities in the helper T cell subtype 1 (Th1) cytokine profile in patients with AS and related SpAs,59,60 and in gut mucosal lymphocytes from patients with SpA.61 The latter finding links the gut immune system abnormalities to the pathogenesis of SpAs. The emergence of data on the pathogenesis of these diseases and the molecular mechanism of the inflammatory process, as well as the development of new treatments that redress underlying pathogenic abnormalities, appear to be occurring in tandem. The workshop on the new treatment strategies was a timely event that provides a solid foundation to enable dramatic improvement in the management of patients with AS and related SpAs in the near future. For the first time there is a real possibility of controlling and modifying the course of these diseases for the betterment of the patients. This review on the therapeutic advances in the management of AS does not cover surgical advances, such as cervical spinal fracture management with halo and vest. Figure 2 highlights these advances, showing a picture of the author who has had AS for the past 46 years. The author, MA Khan, who has had AS for the past 46 years. Reproduced with permission of the author and Blackwell Publishing from MA Khan. Spondyloarthropathies. In: Hunder G, ed. Atlas of rheumatology. Oxford, UK, Blackwell Science; 1998:5.1–24. Khan MA. Ankylosing spondylitis: clinical features. In: Hochberg M, Silman A, Smolen J, Weinblatt M, Weisman M, eds. Rheumatology. 3rd ed. London, Mosby-Wolfe. In press. Khan MA. Update on spondyloarthropathies. Ann Intern Med2002;18:896–907. Feldtkeller E, Bruckel J, Khan MA. Scientific contributions of ankylosing spondylitis patient advocacy groups. Curr Opin Rheumatol2000;12:239–47. Carette S, Graham D, Little H, Rubenstein J, Rosen P. The natural course of ankylosing spondylitis. Arthritis Rheum1983;26:186–90. Burgos-Vargas R, Petty RE. Juvenile ankylosing spondylitis. Rheum Dis Clin North Am1992;18:123–42. Olivieri I, Salvarani C, Cantini F, Ciancio G, Padula A. Ankylosing spondylitis and undifferentiated spondyloarthropathies: a clinical review and description of a disease subset with older age at onset. Curr Opin Rheumatol2001;13:280–4. Ward MM. Functional disability predicts total costs in patients with ankylosing spondylitis. Arthritis Rheum2002;46:223–31. Boonen A, van der Heijde D, Landewe R, Rutten M, Spoorenberg A, Schouten H, et al. Work status and productivity costs due to ankylosing spondylitis: comparison among three European countries. Ann Rheum Dis2002;61:429–37. Zeidler H, Mau W, Khan MA. Undifferentiated spondyloarthropathies. Rheum Dis Clin North Am1992;18:187–202. Dougados M, van der Linden S, Juhlin R, Huitfeldt B, Amor B, Calin A, et al. The European Spondylarthropathy Study Group preliminary criteria for the classification of spondylarthropathy. Arthritis Rheum1991;34:1218–30. Amor B, Dougados M, Khan MA. Management of refractory ankylosing spondylitis and related spondyloarthropathies. Rheum Dis Clin North Am1995;21:117–28. Bakker C, Boers M, van der Linden S. Measures to assess ankylosing spondylitis: taxonomy, review, and recommendation. J Rheumatol1993;20:1724–30. Amor B, Santos RS, Nahal R, Listrat V, Dougados M. Predictive factors for the long term outcome of spondyloarthropathies. J Rheumatol1994;21:1789–90. van der Heijde D, Bellamy N, Calin A, Dougados M, Khan MA, van der Linden S. Preliminary core sets for endpoints in ankylosing spondylitis. Assessments in Ankylosing Spondylitis Working Group. J Rheumatol1997;24:2225–9. Dougados M, Revel M, Khan MA. Spondyloarthropathy treatment: progress in medical therapy. Baillieres Clin Rheumatol1998;12:717–36. Palferman TG, Weblely M. A comparative study of nabumetone and indomethacin in ankylosing spondylitis. Eur J Rheumatol Inflamm1991;11:23–9. Calin A. Clinical use of tolmetin sodium in patients with ankylosing spondylitis: a review. J Clin Rheumatol1983;23:301–8. Schwarzer AC, Cohen M, Arnold MH, Kelly D, McNaught P, Brooks PM. Tenoxicam compared with diclofenac in patients with ankylosing spondylitis. Curr Med Res Opin1990;11:648–53. Amor B, Dougados M, Listrat V, Menkes CJ, Dubost JJ, Roux H, et al. Evaluation des critéres de spondylarthropathies d’Amor et de l’European Spondylarthropathy Study Group (ESSG). Une etude transversale de 2229 patients. Ann Med Interne (Paris) 1991;142:85–9. Coles LS, Fries JF, Kraines RG, Roth SH. From experiment to experience: side effects of nonsteroidal anti-inflammatory drugs. Am J Med1983;74:820–8. Paulus HE. FDA arthritis advisory committee: serious gastrointestinal toxicity of nonsteroidal anti-inflammatory drugs, etc. Arthritis Rheum1988;31:1450–1. Silverstein FE, Faich G, Goldstein JL, Simon LS, Pincus T, Whelton A, et al. Gastrointestinal toxicity with celecoxib vs nonsteroidal anti-inflammatory drugs for osteoarthritis and rheumatoid arthritis: the CLASS study: a randomized controlled trial. JAMA2000;248:1247–55. Simon LS, Weaver AL, Graham DY, Kivitz AJ, Lipsky PE, Hubbard RC, et al. Antiinflammatory and upper gastrointestinal effects of celecoxib in rheumatoid arthritis: a randomized controlled trial. JAMA1999;282:1921–8. Hochberg M, ed. Coxibs: evolution of a revolutionary class. Evolving class and issues surrounding COX-2 inhibitors. Cleveland Clin J Med2002;69(suppl 1):SI-1–84. Dougados M, Behier JM, Jolchine I, Calin A, van der Heijde D, Olivieri I, et al. Efficacy of celecoxib, a cyclooxygenase 2-specific inhibitor, in the treatment of ankylosing spondylitis: a six-week controlled study with comparison against placebo and against a conventional nonsteroidal antiinflammatory drug. Arthritis Rheum2001;44:180–5. Dougados M, van der Linden S, Leirisalo-Repo M, Huitfeldt B, Juhlin R, Zeidler H, et al. Sulfasalazine in the treatment of spondyloarthropathy. A randomized, multicenter, double-blind, placebo-controlled study. Arthritis Rheum1995;38:618–27. Clegg DO, Reda DJ, Weisman MH, Blackburn WD, Cush JJ, Cannon GW, et al. Comparison of sulfasalazine and placebo in the treatment of ankylosing spondylitis: a Department of Veterans Affairs Cooperative Study. Arthritis Rheum1996;39:2004–12. Biasi D, Carletto A, Caramaschi P, Pacor ML, Maleknia T, Bambara LM. Efficacy of methotrexate in the treatment of ankylosing spondylitis: a three-year open study. Clin Rheumatol2000;19:114–17. Altan L, Bingol U, Karakoc Y, Aydiner S, Yurtkuran M. Clinical investigation of methotrexate in the treatment of ankylosing spondylitis. Scand J Rheumatol2001;30:255–9. Sampaio-Barros PD, Costallat LT, Bertolo MB, Neto JF, Samara AM. Methotrexate in the treatment of ankylosing spondylitis. Scand J Rheumatol2000;29:160–2. Roychaudhry B, Bintley- Bagot S, Hunt J, Tunn EJ. Methotrexate in severe ankylosing spondylitis: a randomized placebo controlled, double-blind observer study [abstract]. Rheumatology2001;40(suppl 1):43. Williamson L, Illingworth H, Smith D, Mowat A. Oral quinine in ankylosing spondylitis: a randomized placebo controlled double blind crossover trial. J Rheumatol2000;27:2054–5. Braun J, Bollow M, Seyrekbasan F, Haberle HJ, Eggens U, Mertz A, et al. Computed tomography guided corticosteroid injection of the sacroiliac joint in patients with spondyloarthropathy with sacroiliitis: clinical outcome and follow-up by dynamic magnetic resonance imaging. 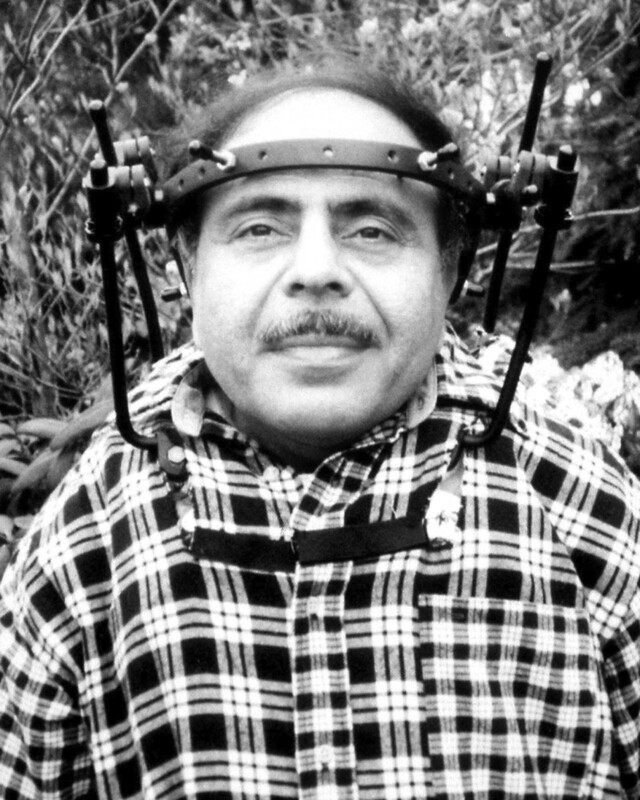 J Rheumatol1996;23:659–64. Gunaydin I, Pereira PL, Daikeler T, Mohren M, Trubenbach J, Schick F, et al. Magnetic resonance imaging guided corticosteroid injection of the sacroiliac joints in patients with therapy resistant spondyloarthropathy: a pilot study. J Rheumatol2000;27:424–8. Granfors K, Märker-Hermann E, De Keyser P, Khan MA, Veys EM, Yu DT. The cutting edge of spondyloarthropathy research in the millennium. Arthritis Rheum2002;46:606–13. Khan MA, Ball EJ. Ankylosing spondylitis and genetic aspects. Baillieres Best Pract Res Clin Rheumatol (in press). Laval SH, Timms A, Edwards S, Bradbury L, Brophy S, Milicic A, et al. Whole-genome screening in ankylosing spondylitis: evidence of non-MHC geneticsusceptibility loci. Am J Hum Genet2001;68:916–26. Feldmann M, Brennan FM, Maini RN. Role of cytokines in rheumatoid arthritis. Ann Rev Immunol1996;14:397–440. Van Deventer SJ. Tumour necrosis factor and Crohn’s disease. Gut1997;40:443–8. Mielants H, Veys EM, Cuvelier C, De Vos M. Course of gut inflammation in spondylarthropathies and therapeutic consequences. Baillieres Clin Rheumatol1996;10:147–64. Kavanaugh AF. Anti-tumor necrosis factor-α monoclonal antibody therapy for rheumatoid arthritis. Rheum Dis Clin North Am1998;24:593–614. Beckham JC, Caldwell DS, Peterson BL, Pippen AM, Currie MS, Keefe FJ, et al. Disease severity in rheumatoid arthritis: relationships of plasma tumor necrosis factor-alpha, soluble interleukin 2-receptor, soluble CD4/CD8 ratio, neopterin, and fibrin D-dimer to traditional severity and functional measures. J Clin Immunol1992;12:353–61. Hanauer SB, Lichtenstein GR, Columbel J-F, Mayer L, Schreiber S, Rachmilewicz D. Maintenance infliximab (Remicade) is safe, effective and steroid sparing in Crohn’s disease: preliminary results from the ACCENT I trial [abstract]. Gastroenterology2001;120:A21. Miani R, St Clair EW, Breedveld F, Furst D, Kalden J, Weisman M, et al. Infliximab (chimeric anti-tumour necrosis factor alpha monoclonal antibody) versus placebo in rheumatoid arthritis patients receiving concomitant methotrexate: a randomized phase III trial. ATTRACT Study Group. Lancet1999;354:1932–9. Moreland LW, Schiff MWH, Baumgartner SW, Tindall EA, Fleischmann RM, Bulpitt KJ, et al. Etanercept therapy in rheumatoid arthritis. A randomized, controlled trial. Ann Intern Med1999;130:478–86. Finck B, Martin R, Fleischmann R, Moreland L, Schiff M, Bathon J. A phase III trial of etanercept vs. methotrexate (MTX) in early rheumatoid arthritis (Enbrel ERA trial) [abstract]. Arthritis Rheum1999;42:S177. MacDonald TT, Hutchings P, Choy MY, Murch S, Cooke A. Tumour necrosis factor-alpha and interferon-gamma production measured at the single cell level in normal and inflamed human intestine. Clin Exp Immunol1990;81:301–5. Baeten D, Kruithof E, Van den Bosch F, Demetter P, Van Damme N, Cuvelier C, et al. Immunomodulatory effects of anti-tumor necrosis factor α therapy on synovium in spondyloarthropathy. Histologic findings in eight patients from an open-label pilot study. Arthritis Rheum2001;44:186–95. Braun J, Brandt J, Listing J, Zink A, Alten R, Golder W, et al. Treatment of active ankylosing spondylitis with infliximab: a randomized controlled multicentre trial. Lancet2002;359:1187–93. Gorman JD, Sack KE, Davis JC Jr. Treatment of ankylosing spondylitis by inhibition of tumor necrosis factor alpha. N Engl J Med2002;346:1349–56. Van den Bosch F, Kruithof E, Baeten D, Herssens A, de Keyser F, Mielants H, et al. Randomized double-blind comparison of chimeric monoclonal antibody to tumor necrosis factor alpha (infliximab) versus placebo in active spondyloarthropathy. Arthritis Rheum2002;46:755–65. Mease PJ, Goffe BS, Metz J, VanderStoep A, Finck B, Burge DJ. Etanercept in the treatment of psoriatic arthritis and psoriasis: a randomised trial. Lancet2000;356:385–90. Lovell DJ, Giannini EH, Reiff A, Cawkwell GD, Silverman ED, Nocton JJ, et al. Etanercept in children with polyarticular juvenile rheumatoid arthritis. Pediatric Rheumatology Collaborative Study Group. N Engl J Med2000;342:763–9. Breban M, Gombert B, Amor B, Dougados M. Efficacy of thalidomide in the treatment of refractory ankylosing spondylitis. Arthritis Rheum1999;42:580–1. Maksymowych WP, Jhangri GS, Fitzgerald AA, LeClerq S, Chiu P, Yan A, et al. A six-month randomized controlled, double-blind, dose-response comparison of intravenous pamidronate (60 mg versus 10 mg) in the treatment of non-steroidal antiinflammatory drug-refractory ankylosing spondylitis. Arthritis Rheum2002;46:766–73.